Some of you who have been reading my posts for awhile may recall this one from last October, Bicycle Bumper Cars, which recounted the experience of being knocked off my bike by a heartless hit and run driver. Since that time I have upgraded bicycles (see photo above) and to say that I am having a love affair with my 2011 Schwinn Madison is possibly the understatement of the year. My Facebook friends are absolutely weary of endless bragging about my mode of transit’s speed, attention grabbing proclivities and general adorableness. Tough for them. I won’t stop. I used part of the cash settlement I received as an outcome of my separation from Eddie to invest in the cycle. I no longer have a car (one of many things I have had to relinquish post-marriage) and my bicycle is now my primary form of transportation. I needed something light (so I can carry it to my third floor walkup), fast and naturally, aesthetically pleasing. The Madison satisfies all of those requirements. But apparently, it can’t do much to protect you from other people. Shame. Yesterday after work, I took advantage of a rare sunny, and somewhat warm Chicago spring day to enjoy a leisurely ride around my neighborhood. I live on a side street in the Rogers Park community and the road is fairly narrow. At one point there was a large SUV that wished to pass me, so I scooted slightly to the right, nearish but not adjacent to a row of parked cars. I was humming along, enjoying the feeling of warm rays on my face, eyes firmly engaged on the pavement ahead when it happened…. BOOM! Car door! Had I ridden by one second later, it would have missed me altogether. Had I arrived a second earlier, I would have swerved around the careless parkers. Just one of those perfect timing things. The impact sent me flying over my handlebars. My front right thigh bears a blackened imprint that bears a perfect resemblance to the bar. I landed on the backs of my hands and slightly to the left of my keister, so there are swollen bruises in both of those general areas. But seriously, apparent bad bike karma aside, I must have a guradian angel watching over me. It could and should have been much worse. My assailants clearly knew they were guilty of attention deficit, because you never saw men so solicitous for my well-being. The real tragedy only became apparent after I stood up and realized that I had not broken any limbs. My beautiful, beautiful bike suffered some scratches, a loosened handlebar grip and – horrors! – a realigned front end. The men held the bike in place and readjusted the forefront of the cycle to a point where I could adequately finish my ride. 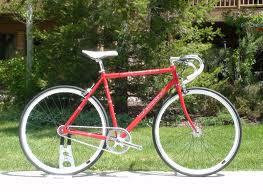 However I will have to stop at a Schwinn shop for a full workup. Yes, I helicopter parent my bike. What of it? The gentlemen did have the integrity to ask if I wanted to call the police, but given that I was alive, if shaken, and my baby (Lil’ Red) was operational, I thought it best to put the incident behind me. I think this narrative provides an accessible metaphor for my life at the moment – a journey into the unknown equally fraught with danger, excitement, and the occasional fall. The bruises adorning my body reflect interior contusions that I often struggle to articulate. I can achieve moments of assured self-confidence yet turn into an insecure sobbing mess just as quickly. There are many things that are exhausting and painful in a divorce, but the sudden removal of a stable identity is among the worst. It presents a tabula rasa on the one hand, yet a sense of failure and isolation on the other. I mean who are we really as individuals, independent of others? Is such a question even answerable? I am slowly becoming aware, through ample self-reflection and quality therapy, that so much of the construction of “I” is based upon relationships: personal, professional and otherwise. Is there a consistent “Becky” that I could identify, had I been a feral child raised alone in the wilderness, a woman who never met parents, sister, husband or colleagues? Would she have any traits that I would recognize, that would remain after 32 years of being smacked by the car doors of culture and society? I admit that I am a little more fearful and cautious in my heretofore bat-out-of-hell riding style after yesterday’s dethronement, so perhaps that answers my question.